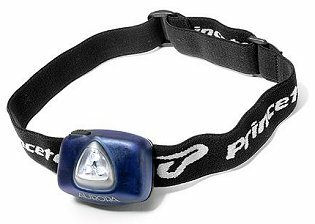 The Aurora LED headlamp is one of several Princeton Tec lights that I tested out, and I liked it a lot. It has three small LED bulbs that are very bright as LED lights go. The lamp is on a "hinge" that allows it to point straight ahead, straight down, or somewhere in between. It can be loosened or tightened with a mini screwdriver. As a hunter, there were several uses for which I found the Aurora to be very well suited. This light was absolutely great for finding my way into the woods before light and finding my way out after light. I used it in several states and on several different types of hunts for that purpose, and it worked great. One of the best things about it is that, being a headlamp, it left both of my hands free to carry things, push brush out of the way, etc. It was plenty bright to find my way to my tree stand or hunting area, but not so bright that it lit up the whole woods, potentially spooking nearby game. This was also an advantage when I was 20 feet up a tree in my treestand, organizing my things and getting ready for daylight. I didn't feel as though I was alerting the whole woods to my presence. I felt more like just a pretty bright star in the sky. Here again, being able to use both of my hands was very nice. Using it when setting out duck decoys in the dark is just one more way it was useful to me personally. You definitely need both hands when setting out decoys, and if I needed to untie a line knot or some such thing, I had both hands available to do it. It was also nice when camping out on a hunt. I would leave it by my sleeping bag in the tent and use it to get my stuff ready in the pre-dawn, and the light wasn't so bright that it would wake up my wife and children just feet away. One last thing that I found it very useful for was in "staying alert" while bowhunting wild hogs at night. In Texas, it is perfectly legal to hunt wild hogs at night. We hunt them out of treestands near bait. When sitting in a treestand deep into the night while hunting hogs, it is easy to start nodding off to sleep. I used the Aurora to read a book in my treestand. It helped me to both stay alert and to stay in my treestand longer. Several times I had hogs come in to the bait while I was reading, and the light didn't seem to spook them at all. One thing I did not use it for was blood trailing. It just wasn't bright enough for my personal preference, but some of Princeton Tec's other lights were more than capable of that task. I've used the Aurora countless hours so far and haven't been able to determine that it's become any dimmer. I prefer to use the Aurora for the "smaller" tasks where a super bright light isn't necessary, and save my Princeton Tec Predator Pro for the big tasks, like blood trailing, where a very bright light is important. I highly recommend the Aurora to all hunters.